Established in 1581 and opened to the public in 1765, the Uffizi is among the oldest and most famous art museums in Europe. It is situated in Florence and visited by some 2 million people annually. Its art collection contains 12th – 17th century European art most of which is Italian. The exhibition space has been expanded considerably over time to bring more art in front of visitors and out of storage facility. 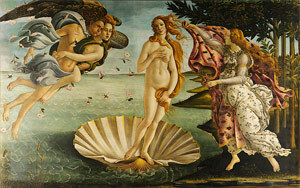 The art collections contain three important works by Sandro Botticelli. 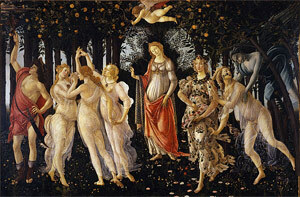 The world famous Birth of Venus (1484–1486), La Primavera or Allegory of Spring (1477–1482); and 2 of the 7 versions of Adoration of the Magi (1475–1476). 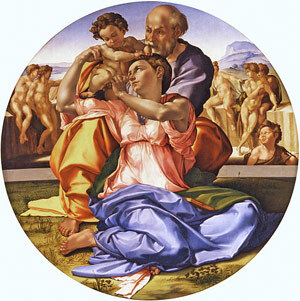 Notably there is the Michelangelo painting Tondo Doni on display, also called Doni Madonna, or the Holy Family. Originally intended as a wedding present, it is not only a remarkable painting by someone who would rather sculpt his motifs, it is also the only finished panel painting by the mature Michelangelo to have survived to this day. Another famous highlight in the exhibition is the egg-tempura-panel The Battle of San Romano by Paolo Uccello, which vividly shows an incredibly complex composition. The panel depicts a historical event from the days when Italy did not exist as a united nation and city states were in war with each other constantly. It is one of a three panels illustrating Florentine and Sienese forces in 1432. Sadly you cannot see all three panels together due to one residing at the National Gallery in London and another at the Louvre in Paris. But then again, it is the best excuse for visiting all three art museums that anyone could come up with. Although the emphasis is on local art, there are some foreign imports. E.g art from the hands of Dürer, Goya, Rembrandt, Rubens and Velázquez. For anyone who is into antiquity, the restored Niobe room represents Roman copies of late Hellenistic art. In 1560 Giorgio Vasari commenced work as the lead architect on the building now known as the Uffizi. The name Vasari might ring a bell with many people, because he wrote the book ‘The Lives of Artists’, which has long since become an essential part of art history curricula across the world. By writing about the artists, whose work also happens to have been acquired for the collection, the author-architect has helped immortalise the artists’ and their contribution to art. The museum is a two-winged palace with courtyard in the middle. The palace is a mannerist architectural gem which cortile provides the illusion of a narrow street leading to the river Arno. The niches in the piers alternate with columns filled with sculptures of famous artists from the time that the palace was built. Uffizi means offices in Italian, and that is exactly how it all began as Tribunal, administration and archive for the city state of Florence/Firenze. Vasari worked for Cosimo I de’ Medici to accommodate the offices of the Florentine magistrates. 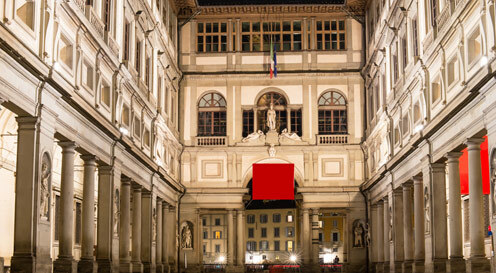 The intention with the building was to make Uffizi a kind of Whitehall spillover to Westminster deal. So it was erected right next to the town hall Palazzo Vecchio, and the town hall is even connected with the Uffizi with a skyway to keep the heads and feet of local government officials dry on rainy days.